This month’s focus will be on the activation of the Third Eye/Crown chakras. Each presentation uses ancient master singing bowls or gongs that are attuned to the month’s chakra theme. your Crown must be open and your Third-Eye of course. with the ”A” and “B” notes to activate you! This month’s frequency activation will focus on the high frequencies of “A” and “B”, to facilitate the magical journeys through the galactic gateway of the pineal gland. Opening this chakra region can aid in clear intuitive sight, integrity to self-purpose, and clarity of feelings. The third eye is “A” link to universal consciousness. The crystals are amethyst, moonstone, and tanzanite. The frequency note to activate and open this chakra is “A”. 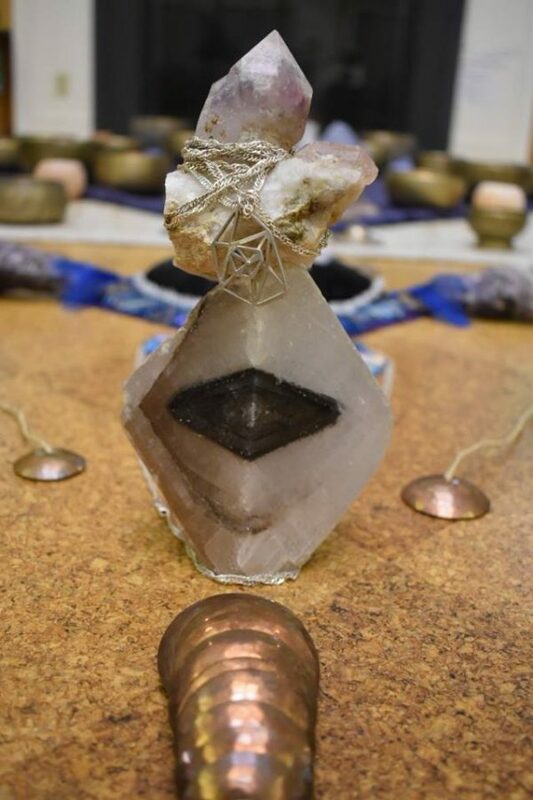 This month the Crystal bowls return providing a strength of clarity and purpose, sure to open your third eye. A rare Quartz crystal bowl made from amethyst will fill the room with the concert pure pitch note of “A”. This is your chance to stimulate the pineal gland in the middle of your brain. These activations can produce “A” profound psychedelic experience without the risk of psychotropic drugs or side effects–“A” Natural, safe, and soothing journey to deeper realizations. In the American Journal of Health Promotion, Tibetan singing bowls were used compared to Silence before a relaxation exercise. Scientists found the singing bowls produced greater decreases in Blood Pressure and Heart rate than simply silence. The Sound Bath Meditation has been a very positive and uplifting experience for me. I describe it as a beautiful immersion into stillness and harmonic vibrations “bathing” your whole being and assisting you in feeling more unified with your surroundings and with other beings. Thank You, Human Activation to make this possible. Questions? Email monte@crystalashram.com or call or text 410-980-1324.